In early 2014 December I took part in medieval mystery plays presented by the Players of St Peter. The production included the Parliament of Heaven in which two daughters of God, Peace and Mercy plead with God that Man currently bound in Hell for original sin should be released and the other two daughters, Truth and Justice argue that he should stay in hell. That hell hound that hateth thee, bid him cease. Thy loved man, no longer let him keep. This scene segues (horrible word!) into a feminist Annunciation scene in which the angel Gabriel does not tell Mary that she is going to be impregnated by God. Instead he asks her politely if she is willing for it to happen and waits patiently for her answer. The nearest station to where we perform is Shadwell which is served by direct trains from West Croydon so Croydon Friends have very little excuse for not attending in droves. On 2015 Jan 24, Saturday, Rhiannon Rees, wearing her CND hat rather than her Quaker bonnet, dragged me up to Westminster to join in the Wrap Up Trident demonstration. 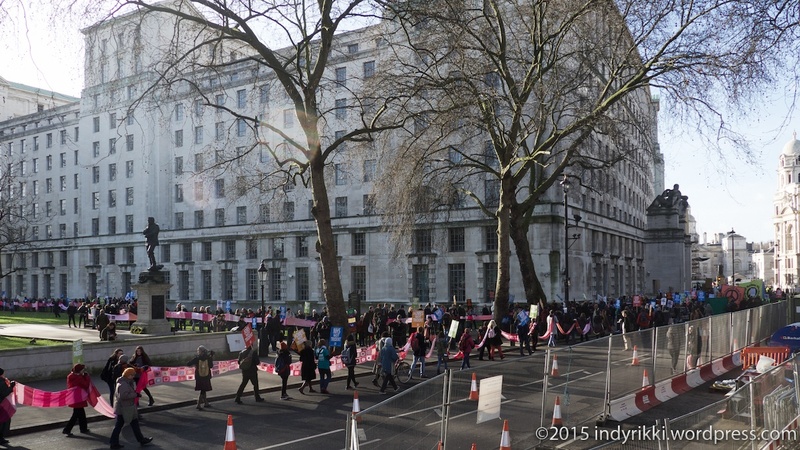 A long pink scarf which had been used at demonstrations in Aldermanston was brought out again and we payed it out from the Ministry of Defence building in Horse Guards Avenue along Whitehall, Parliament Street, Bridge Street and Victoria Embankment back to where we started - a distance of nearly a kilometre - and with more to spare. Photo licence and more photos. The scarf outside the Ministry of Defence building seen from the Victoria Embankment. We then marched to Old Palace Yard where various speakers preached to the converted. There I met Janet Cowen (see Mysterious activity above). She said "I have walked the whole length of the scarf and am impressed by the number of Quaker banners I have seen". So where were Croydon Quakers? The group from Stoke-on-Trent had a banner saying "pots not bombs". What could we put on ours - "trams not bombs"?